Sometimes it's only a matter of time until an artist lands a number 1 hit. And for Janet Jackson, the inevitable came in May 1993, when she finally did locally what she'd been doing in America regularly for years. Unless she still has something up her sleeve, it's the only time she's reached the top of the ARIA singles chart and it may have only been for one week, but a number 1 is a number 1. The song Janet would go on to dethrone in the coming weeks ascended to the number 1 spot this week in 1993. "Easy" by Faith No More spent its first of two weeks on top. Managing what neither release of Sting's "Englishman In New York" had done, this reggae remake by the British-born, US-based singer/rapper reached the top 100. I would've sworn this debut single by Melbourne's The Badloves had been a much bigger hit, but it fell just short of taking the pop/rock band into the top 50 - although they'd get there later in the year. Having finished re-releasing and repackaging his early releases, Chris Isaak got on with putting out new music, but this lead single from San Francisco Days didn't have the same impact as his previous hits. As "Mrs Robinson" fell out of the top 20, the title track of The Lemonheads' breakthrough album joined it on the top 100. The title was inspired by a Sydney newspaper headline, while Johnny Depp appears in the music video. It'd first reached the top 100 in November 1992 (stalling at number 95), and this week in 1993, the lead single from Sade's fourth album, Love Deluxe, jumped back onto the chart at number 50 thanks, I'm assuming, to its use in the recently released film Indecent Proposal. 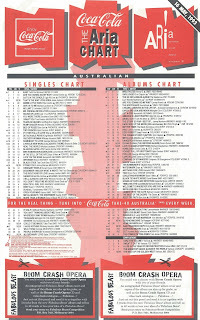 Only the sophisti-pop band's second (and, to date, final) hit in Australia, "No Ordinary Love" would climb all the way up to number 21, one place short of the position achieved by breakthrough single "Smooth Operator" in 1984. After the brief detour into dance-pop that was "I'm Every Woman", Whitney Houston was firmly back in power ballad terrain with the David Foster co-written and produced third single from the Bodyguard soundtrack. Every bit as epic as "I Will Always Love You", the dramatic "I Have Nothing" might not have been anywhere near as big as its predecessors - after all, the album was in its 19th week in the top 10 (including five weeks at number 1) - but it has stood the test of time. In the past decade, the key change-featuring torch song has been a staple of TV singing competition shows, although no one has come close to matching Whitney's flawless rendition. As with Janet Jackson, it seemed like it'd only be a matter of time until boy band Take That eventually landed a number 1 hit, at least in Britain. Up until this point, their singles had peaked at numbers 82, 38, 47, 7, 15, 7 and 3 on the UK chart - a mostly upwards trajectory that seemed to be heading towards the inevitable. The song that put them into top 5 territory there and gave them their first ARIA chart hit was a remake of a song co-written and originally released by Barry Manilow... three times. In 1971, session musician collective Featherbed (which included Barry) recorded the single, and then Barry recorded a solo version which was released first in 1973 and in remixed form in 1975. Two decades later, a dramatically remixed (and improved) version of the Take That And Party track was issued as the album's seventh single in time for Christmas 1992 in the UK. Several months later, it put Take That on the radar in Australia, but for the time being, they were much less popular than their chart rivals from back home, East 17. Whereas the Walthamstow four-piece were edgier and incorporated rap into their sound, Take That were pure pop, although they did have a bad boy member in their ranks: Robbie Williams, who took the lead on "Could It Be Magic". As it would turn out, Take That would end up topping the Australian chart, but that would take a lot longer than it did in the UK. While Take That tackled Barry Manilow, Australian five-piece boy band Boys In Black tried their hand at a Bee Gees tune for their debut single. The Saturday Night Fever song had reached number 31 in 1978 for the brothers Gibb, while an alternate recording by Tavares has also been included on the soundtrack. But while "More Than A Woman" was a good choice for a cover, this remake felt somewhat undercooked. From the tinny production to the out-of-place rapped bits, it wasn't quite up to scratch - and the record-buying public responded accordingly. His previous two singles, "Sweat It Out" and "Stand Up", had been met with a muted reaction, and so it was back to more typical Jimmy Barnes fare for the third single from Heat. A bluesy rock ballad, "Stone Cold" was written by Cold Chisel's Don Walker and featured another of Jimmy's former band-mates with Ian Moss playing guitar on the track. Unsurprisingly, it was the biggest hit from Heat and Jimmy's best performing single since his duet with John Farnham in 1991. It also helped the album return to the top 10 adding another six weeks to its initial tally of four. By 1993, Janet Jackson already had five US number 1 singles to her name, but the closest she'd come in Australia on her own had been when she reached number 6 with 1986's "What Have You Done For Me Lately" and "Black Cat" in 1990. Then, in 1992, she and Luther Vandross almost topped the ARIA chart with "The Best Things In Life Are Free", so when she returned the following year with the lead single from fifth album janet., the time felt right for her to finally hit number 1 locally. Janet's popularity here had been building steadily since her mid-'80s breakthrough, she'd just signed a record-breaking $32 million record deal with Virgin Records (who would therefore put everything behind the new album) and the cruisy, carefree vibe of "That's The Way Love Goes" gave it a broader appeal than anything she'd released up until this point. The song, which replaced original frontrunner "If" as the track that would kick off the janet. campaign, perfectly encapsulated the tone of the album, which covered romantic and sexual terrain (unlike her previous two more statement-driven albums). The tune's music video, which featured a then-unknown Jennifer Lopez, was also a change of direction for Janet, eschewing her trademark complex choreography for something more casual and laidback. All of those factors combined resulted in "That's The Way Love Goes" bursting into the ARIA top 5, with Janet's long-awaited number 1 coming two weeks later. Next week: three acts that were massive in the '80s return to the top 50 after lengthy absences. It's odd that the Shinehead track made the top 100, but the Sting original didn't. I knew the Sting original before hearing this version; I guess from seeing it on rage or hearing it on the radio. 'Lost' seemed to receive a fair bit of airplay, as did later Badloves singles. They were a bit too MOR for me, but I liked 'Slave' from the second album, which of course flopped. I didn't know the Chris Isaak track until some years later, but remember this album being reviewed in the Brashs magazine. Not being a movie buff, I didn't cotton on at first why 'No Ordinary Love' suddenly entered the top 50, despite being released back in October '92; but I'm glad that it did. Some weeks into its chart run, rage aired a version of the video with some movie dialogue snippets during the instrumental breaks, including the infamous "I'll give you a million dollars to sleep with your wife for one night" (or whatever it was). 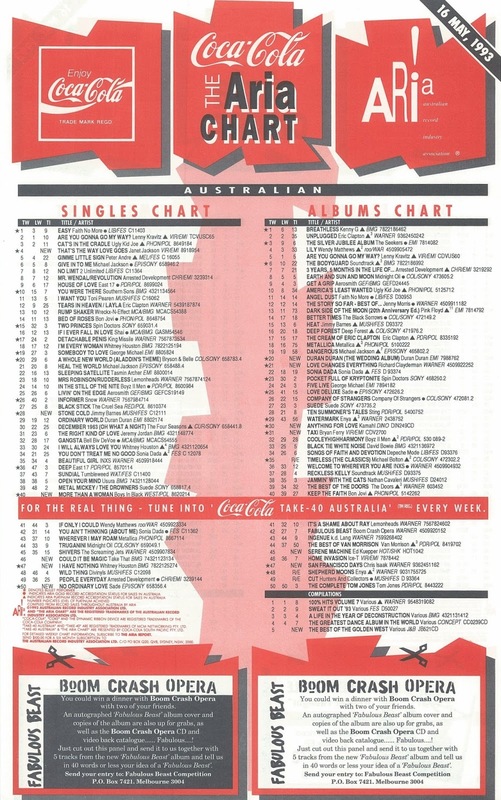 It does seem wrong that Sade only had two top 40 singles in Australia, though I guess they did fairly well on the albums chart. I find 'I Have Nothing' pretty much unlistenable. That it has become an X-Factor/The Voice/Idol/Got Talent staple says it all, really. 'Stone Cold' was just awful. I thought 'That's the Way Love Goes' was awfully bland at the time, and never really understood its popularity. Looking at the albums chart - there's a lot of old fuddy duds in the upper echelons of the chart (Kenny G, Eric Clapton, The Seekers, Richard Clayderman, Kamahl). I guess it was near Mother's day, but I remember this being an awful period where my parents bought many CDs I didn't like (and would play them loudly), including some of the aforementioned artists. Going by this week's debuts, the singles chart wasn't exactly a haven for pop at this time, either. It's interesting that the Janet single debuted on her birthday. Take That's version of "Could it be Magic" was quite atrocious. Playing it next to Donna Summer's definitive version drives the point home!